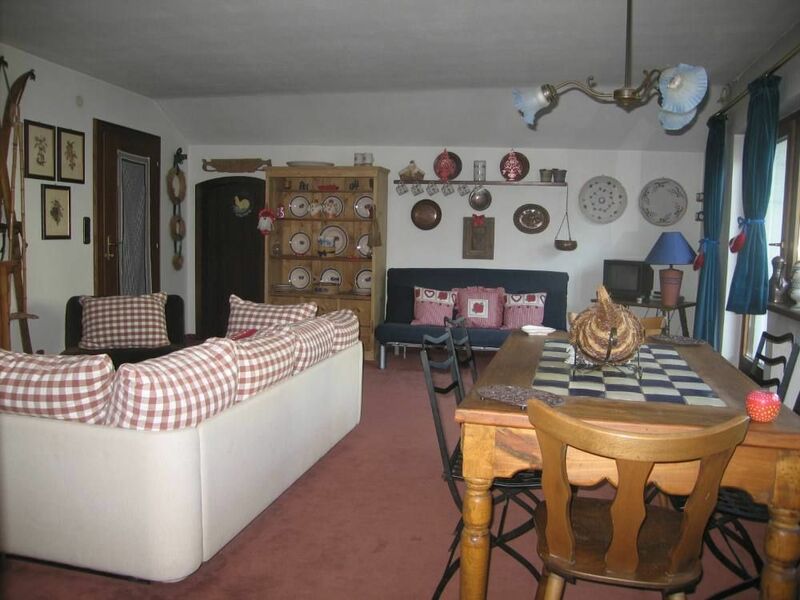 Apartment of 60 sqm., for 4/5 persons, located on the 3rd floor of a Condo, without elevator, in the Center of Kitzbühel, enchanting Austrian tourist resort. The accommodation comprises of: an entrance hall, a large living room with lovely views of the Gothic Parish Church of “St. Andreas” and of the “Liebfrauenkirche”, divided into a dining area and a living area with double sofa bed, a kitchen, an attic room with no. 2 single beds, a further attic room with no. 1 single bed, a bathroom with tub and shower, a warehouse, a terrace of approx. smq. 10,00. An additional warehouse is located in the basement of the building. The small bright loft is furnished with a warm and cozy style. Just looking out of the windows to be immersed in a typical Tyrolean atmosphere, to enjoy the beauty of the old houses painted and of the changing colors of the landscape, to observe the slow passage of the horse-drawn carriages. Gone out from the apartment it is in the heart of the City: bars, taverns, restaurants, supermarkets and then shops of every kind. The central location allows to reach in just a few minutes walk away, with a walk through the Old Town, the Hahnenkamm Ski Area famous for downhill race that takes place every year on the 'Streif' (World Cup Alpine Skiing 21.01.2015-25.01.2015). And yet the very near Aquarena Swimming, Health and Wellbeing Centre. Several hiking trails in summer and cross-country skiing tracks in winter begin in the vicinity of the Condominium. Within a radius of 2 km, 5 different Golf Courses can be reached. A Public Parking in Kirchplatz (free from Monday to Friday from 18h00 to 08h00, Saturdays, Sundays and Public Holidays) at the side of the building, allows the loading and unloading and short-term. The car can still be parked, free of charge and indefinitely, in a large Parking (P4 - Parking Place Pfarrau) which is not more than 5 minutes walk in the direction of the Swimming Lake Schwarzsee. We love a lot Kitzbühel, but from some years, because of the demands of work and family, we are able to come to Kitz only a few days during the year. Kitzbühel is a wonderful place and it seemed to us sad that the apartment was always empty. The apartment has definitely some features that, at least for us, make it special. The View of the Parish Church of St. Andreas and the mountains around that allows you to participate in all the events of the Country. The Position in the Old Town and thus the proximity to any kind of shops, supermarkets, taverns, restaurants ... The Proximity to Hahnenkamm Ski Area and therefore the opportunity to travel on foot to ski. For logistical reasons, the arrival might take from 16h00 onwards and the departure before 11h00 a.m. Different schedules of arrival and/or departure they can always be agreed upon together. The town of Kitzbühel is conveniently connected to the Airports of Munich of Bavaria, Salzburg and Innsbruck. By Plane: Airport Munich of Bavaria: 160 km, www.munich-airport.de; Salzburg Airport: 80 km, www.salzburg-airport.com; Innsbruck Airport: 90 km, www.innsbruck-airport.com. By Train: International Railway Station Kitzbühel; www.oebb.at at times; Schneeexpress in winter from Salzburg booked at www.salzburg-airport.com. By Car: From Innsbruck: A12 motorway to Wörgl-Ost, 30 km. of road to Kitzbühel; From Munich of Bavaria: Motorway A12 to Kufstein-Süd 26 km of road to Kitzbühel. "The apartment was very nice with central location. We had everything we needed. You need to walk a little to the ski lifts. The owner was very helpful at the day of our arrival and especially when Homelidays web site started to send strange e-mails that we cannot trust information on the Homelidays website without giving any additional information." "Great facilities in the center of the village. Walking distance (about 5 minutes) from the lift and 1 minutes walking to the main pedestrian street. Appartments are fully equipped with everything you need to have a nice time there. Free parking is less then 5 minutes walking away." "A very convenient location and a very nice view from the window for more than a very reasonable price. A sharm cosy small appartment, ideal for a family!" Great apartment with a very good location, in city center. It took us less than 10 minutes to walk to the lifts. Both the internet connection and the dishwasher were nice surprises. The little kitchen has every ting needed to cook. The only "negative" is that there is no elevator. But, if you can ski you can walk the three stairs. Très chaleureux et sympathique accueil de la Famille Bellio ! "Tres bon accueil de Mr et Mme Bellio, tres bel appart spacieux et lumineux, tres bien situe en plein centre ville a proximite des commerces, pubs, restos,..."
Kitzbühel, m. 800 altitude, 8.100 inhabitants, located in the west of Tyrol, is a destination known to International Tourism. Characterized by broad landscape joined the impressive backdrop of mountains of the Wilder Kaiser, Kitzbühel Horn and the Hahnenkamm, the Town has always been synonymous with two things: sports and lifestyle. During the Winter Season the Kitzbühel Alps are one of the major Ski Areas in Austria. The winter sports enthusiasts have an area of 729 km., divided into seven ski areas: Kitzbühel, SkiWelt Wilder Kaiser-Brixental, Schneewinkel, Wildschönau, Alpbachtal, Saalbach Hinterglemm and Zell a. See/Kaprun, with 252 lifts and countless tracks: 171 blue (easy), 191 red (intermediate), 48 black (difficult), connected by a single ticket, the AllStar Card . The cable car AG Kitzbühel is the most important enterprise of lifts super modern Austria to meet the needs of athletes with snow-covered slopes, shelters and local supply. In the district of Kitzbühel, nestled between Horn and Hahnenkamm, in the north-west barrier, it is practically always guaranteed the opportunity to ski down to the valley from December to April. In fact, thanks to the peculiarity of his 'Grasberge' , the mountains grasslands which retain their turf to 2.000 m. of altitude (in contrast to most of the other ski districts) already little snow is sufficient to ensure a durable snow-covered slopes. And another 40 km. of cross-country ski trails, slopes for snowboarding, and one downhill run, approved by the FIS, toboggan runs and night skiing on the mountain Gaisberg. International Tournaments: Snow Polo World Cup (15.01.2015-18.01.2015); World Cup Ski-Hahnenkammrennen (21.01.201- 25.01.2015). During the Summer the hiking region of the Kitzbühel Alps still offers endless possibilities: 2500 km of marked trails and 25 themed hiking trails, including the Trail Alpinolino suitable for children with games and entertainment and the beautiful panoramic Triassic Park. Over 800 km. of bike paths and trails in mountain biking, from early May to late October. Trails for every kind of rider. The Hohe Tauern National Park is easily accessible by car. The main attractions and the most popular hiking destinations in the National Park are Krimml Waterfalls, Waterfalls Umbal, the Trail of Glaciers Innergschlöss (Matrei in East Tyrol), the Franz-Josef Höhe on the Grossglockner, the Highest by the Grossglockner High Alpine and the Museum of the National Park in Mittersill. 12° Golf Festival Kitzbühel from 22.06.2014-29.06.2014: Golf Event of the year in Kitzbühel. 11 Tournaments in one week, including the infamous 'Streif Attack' played on the most famous Hahnenkamm downhill. Bet-at-Home Cup (Tennis) Kitzbühel 27.07.2014-02.08.2014. Great Tradition Folk and excellent Tyrolean Cuisine. Delivery of the keys from the Owner. The arrival and departure times can be agreed together. Usually the Check-in is from 14h00 p.m. onwards and Check-out before 12h00 a.m. The Check-in after 20h00 incur a fee of € 50,00. The Local Tourist Taxes, amounting to € 2,00 per person (over 11 years) per night, they are not included in the price. The Expenses for the Banking Transaction are to load of the Guest.